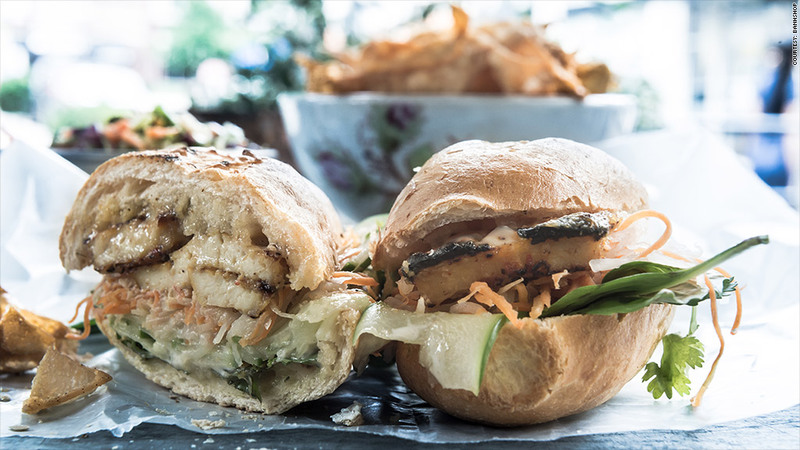 Yum Brand's new restaurant serves traditional Vietnamese banh mi sandwiches. If you're not up for Mexican tonight, why not try some Vietnamese fare? Yum Brands, the owner of Taco Bell, KFC and Pizza Hut, is testing a new restaurant called the Banh Shop. The first location opened on Friday in Dallas, and a second is scheduled to open later this month at the Dallas/Fort Worth airport. On the menu is a medley of Southeast Asian cuisine, including a number of Vietnamese banh mi sandwiches. One sandwich piles chicken, red onion, scallions and noodles on top of a baguette, topped with a cucumber-cilantro aioli. The restaurant also serves Vietnamese-style chicken soup, as well as a "Drunken Noodles" bowl that features stir-fried rice noodles tossed with Thai basil and vegetables. If successful, the Banh Shop could bring Yum Brands into the fast-casual space to compete with chains like Chipotle (CMG) and Panera (PNRA). The food comes out quickly, but there's also an emphasis on serving healthy meals. This is only Yum's latest foray into the space. It opened a U.S. Taco Co. in Huntington Beach, Ca. earlier this year. The eatery is a step up from Taco Bell and offers specialty tacos like the "Brotherly Love," served like a Philly cheese steak in a flour tortilla. Yum Brands (YUM) had a tough summer due to a food safety scare in China. Sales plummeted at its restaurants after a meat factory was accused of selling the company out-of-date and tainted meat.